Crossbreeding is the most widely used production system in the swine industry, and thus the genetic improvement goal is to improve crossbred performance under commercial conditions, writes Dinesh Thekkoot PhD, Genesus Inc. There are two distinct advantages for crossbreeding; (a) heterosis and (b) breed complementarity. Heterosis or hybrid vigor is the increase in performance of a crossbred offspring compared to the average of its parents. A detailed article about heterosis can be found here (http://www.genesus.com/global-tech-report/heterosis). Breed complementarity brings together traits that are specifically selected in pure-line parental breeds, but are difficult to improve simultaneously in one breed. In a typical crossbreeding system, the animals that produce commercial crossbreds are developed through a pyramid type breeding program. 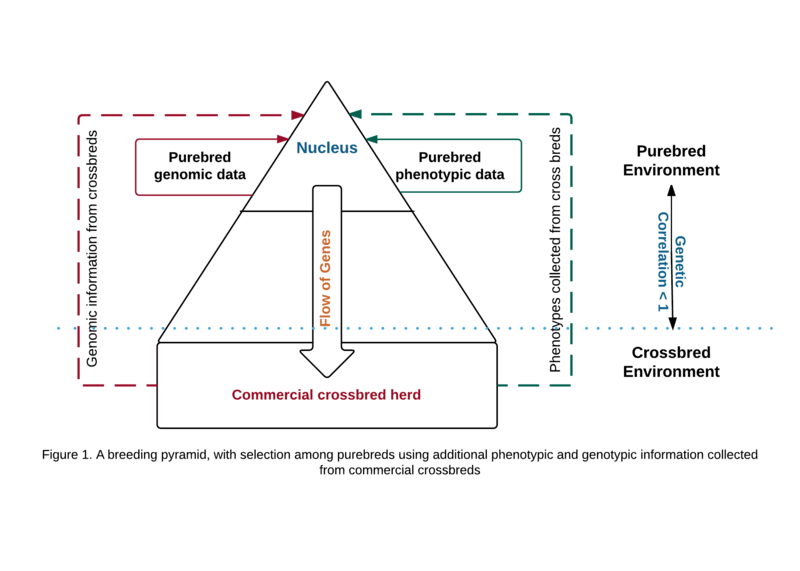 Genetic selection is carried out in the purebred nucleus herds, at the top of the pyramid, and the genetic improvement goal is to improve commercial crossbred performance at the base of the pyramid. Due to management, health, nutrition and environmental differences between nucleus and commercial herds, the performance of pigs at the nucleus and commercial herds may differ. The genetic correlation between the same trait recorded in nucleus and commercial herds may be lower than 1 indicating that the genetic control of the trait may differ between nucleus and commercial herds. For traits with a genetic correlation of approximately 0.7 or less, it is suggested that data from commercial farms be incorporated into genetic evaluation programs to obtain greater genetic responses in the crossbred populations. Wei and van der Steen (1991) proposed a method called combined crossbred and purebred selection (CCPS), which utilizes the phenotypic / pedigree data collected on crossbred relatives for selecting purebred animals in the nucleus. This method results in better long term genetic response compared to pure-line selection, but increases the rate of inbreeding and also requires continuous recording of performance and pedigree at the commercial level (Bijma et al. 2001). This method requires that nucleus boars are used simultaneously in both commercial and nucleus herds, so that the selection of progeny in the nucleus benefits from half-sib performance at the commercial level. This requirement as well as the need for accurate pedigree information on crossbred animals is two major limiting factors for CCPS. The recent advances in molecular genetic technologies have made high throughput single nucleotide polymorphism (SNP) genotyping more cost effective, and hence can be used to overcome some of these limitations. Based on SNP information, different genomic selection methodologies have been proposed for selecting purebred parental lines for crossbred performance. Dekkers (2007) demonstrated a method, called CC-MAS, where marker effects estimated at the commercial crossbred level were used to select the purebred parents in the nucleus. The implementation of CC-MAS requires the effects of SNP markers that segregate in purebred population on crossbred performance to be estimated. This requires collecting genotypic and phenotypic data at the crossbred level, along with their purebred parents. A schematic representation of this process is in Figure 1. Studies have shown that this method, not only increases the response in crossbred performance, but also reduces the rate of inbreeding without requiring extensive pedigree recording at the crossbred level. Recently multiple authors (Zeng et al. (2013) and Esfandyari et al., (2015)) have come up with new genetic evaluation procedures by including dominance in the model for evaluating purebred parental lines for crossbred performance in a more accurate and cost effective way. But these studies were conducted using simulated data, and hence require further validation before implementation.